I had that “sick in the pit of my stomach” feeling you get when you show up at an event in the exact same outfit as someone else. ( Which wouldn’t be such a big deal if you hadn’t spent so much time and effort in finding “the perfect one”). Then you are thrown into a real life version of Who wore it Best. But it wasn’t a dress, it was an article that I was writing for you. It was a wild, crazy adventure I learned a valuable lesson from and I wanted to take you along for the ride. My husband had been out of town, so we met family for dinner halfway between where he’d been and home. After eating we still had a 2 1/2 drive, so I checked my gauge to be sure I had enough gas. (I promise). And I kept checking throughout my trip, but something crazy was happening – the miles to empty we’re dropping like I had a hole in my tank! How did I get into this situation? I had taken this road so many times and never experienced anything like this. What was different? Frantically I called my husband as the mileage dropped in half! There was nothing he could do, we’d already passed the last station. He kept me on the phone as we counted down the miles praying to make it home. His greatest concern was the danger of running out of gas on the River bridge just outside of town. Rolling up to the bridge my miles to empty hit 1. I held my breath and prayed that we would please make it to the station. I was literally running on empty! “Running on Empty” was the title of the other article. So was mine! She also had cuter graphics which made me consider throwing mine out. Nothing new? No example, no experience. Just different people, different versions in different times and places. 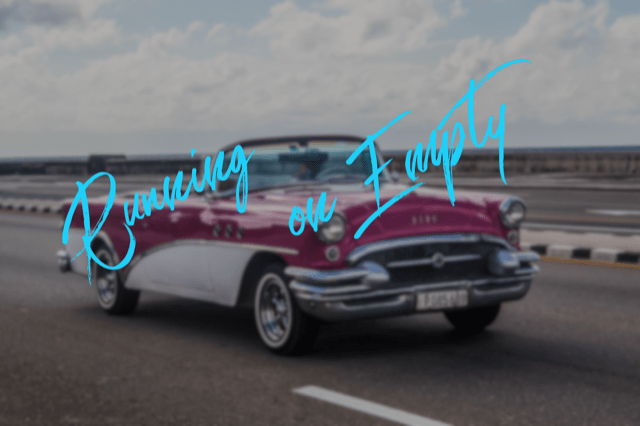 Her experience and mine contained the same lesson- how we let ourselves get in a position of running on fumes when we’d had so many opportunities to refuel. But so often we wait until it is too late. We run ourselves ragged, pouring out all we have, rarely stopping to be poured into. Or even worse, feeling helpless as we stand by and watch it drain away. I realized at that moment if we experienced the same story how many others had too? In my situation it was the heavy winds bombarding me from every side that depleted my tank. What is is bombarding your life and draining you? Someone challenged me the other day to step up and fulfill the purpose I know I am called to. After I agreed the song “This is me” came on the radio. I felt so empowered I wanted to burst through the front doors and shout it to the world. My purpose is to help you feel the same way ( I couldn’t find a cool graphic of a woman bursting through doors). You have a purpose to fulfill and whether you think it’s already been done or you’re running on empty, I’m here to encourage you and refuel you; together we can do this! My car miraculously coasted into the gas station well below 0. If my husband hadn’t been encouraging me along the road I don’t know what I would have done. It is so much easier to conquer a challenge when you’re not alone! So, won’t you join me on this crazy, wild ride? I don’t promise it will be easy, but it will be fun! I’ll encourage you with my adventures if you encourage me. NextRun, Don’t Walk Through That Open Door! This happened to us going from Germany from Alsace at night on country roads with two little kids in the car. SO stressful. We were praying hard and made it.